Before we go on to today's post, a friendly reminder to link all your Chinese dishes to the Flavours of China event that ends Nov 30th. Also dont forget to link your global recipes to the Global Food Fest too ! Up for grabs is also a wonderful giveaway on my 200th post, so do rush in.. Some memories stick to you like a Post-it note :-) I remember by dear dear grandpa who used to get these super hot and freshly baked Potato Buns once a week, from the bakery by the time we got from school, and sis n me used to gobble them up like hunger was our prime concern :-) Many years later, i discovered that these things could be baked at home too ! 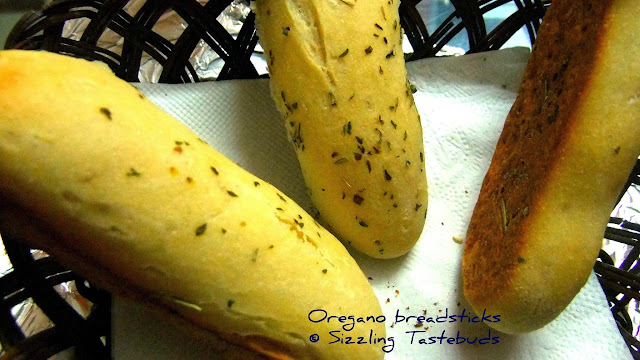 I have adapted my recipe from Aipi's recipe as I gingerly tread into the realm of yeast-based baking : Now each one of us has our tryst with this ingredient called yeast. Yes, baking with it is quite addictive, but you want the result to be exactly to the the way you remember it or seeing it. As I was making it with APF (and was too sceptical about using whoewheat), I have replaced most of the filling of potato with dry cooked moong dal (to know the right dal consistency, check recipe on Moong Dal Seekh Kebab) - it needs to be cooked al dente, but dry. It was very light and filling too. Although here, I was a tad disappointed coz the colour of the buns didnt brown as much as I thought they would, but the verdict from all at home was tres bien (wonderful), and mom who is not too much of a bakery food fan pronounced the Moong dal Masala Buns perfect. The next time I make this (which I am sure to), I would increase the sugar a tad more and also may be do the milk wash more diligently, but till then, this is one snack that would never go out of fashion and I am sure you would also like it.. Feel free to play around the ingredients to suit your palate.I used the remaining dough after making the buns to make Oregano soup sticks which went very well with Cauliflower Soup. 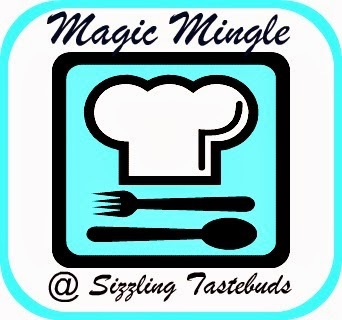 Day 1 of Blogging Marathon - Winter Foods for Nov'11. Do check out my fellow marathoners here. 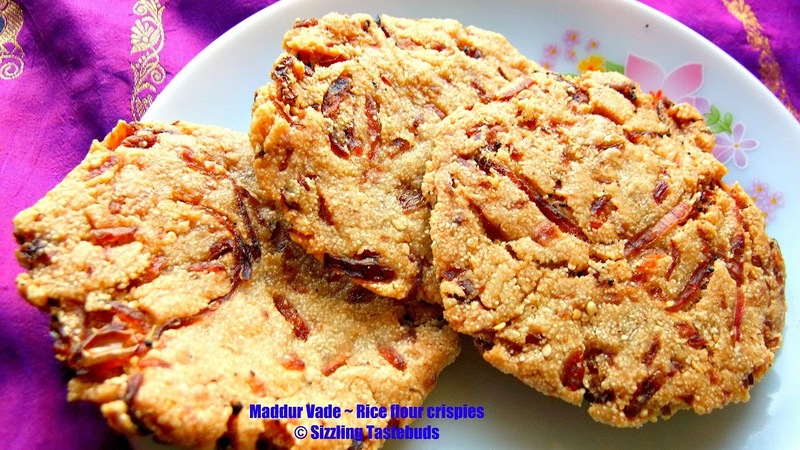 Check out other side dishes for Roti here. 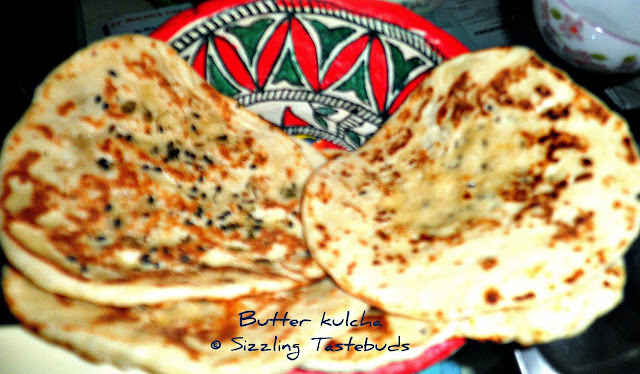 Winters and parathas - an ubiqutous combination ! 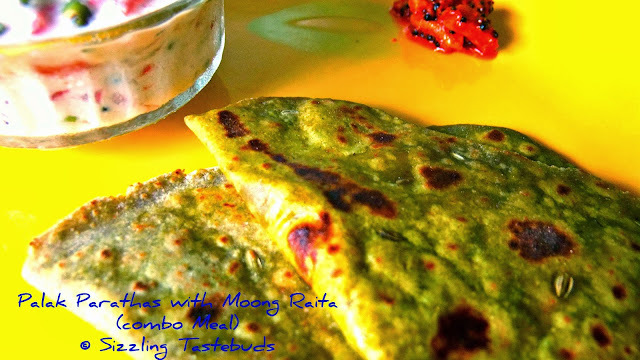 While its not yet officially winter here where I live, the warmth that certain foods bring - you wish they had it all year ( I fondly wish I could have Alu Paratha with pickle right now) .. Today's post is a combo meal - Palak Parathas with Moong Raitha- and highly nutritious too. Combo meals are my fav- and this can be rustled up for any part of the day - breakfast / lunch / dinner and is a great meal for kiddies mealbox too :-) The goodness of Spinach is something that Popeye (the cartoon) brought to the West, but Ayurveda has always been a proponent of fresh greens in all saatvic foods. Wikipedia tells me: "Spinach is thought to have originated in ancient Persia (modern Iran and neighboring countries). Arab traders carried spinach into India, and then the plant was introduced into ancient China, where it was known as "Persian vegetable" (bōsī cài; 波斯菜; present:菠菜). The earliest available record of the spinach plant was recorded in Chinese, stating it was introduced into China via Nepal (probably in 647 AD)"
And there is moong sprouts. What more can be said about this wonderfood - rich in riboflavin, moong sprouts is a powerhouse of vitamins and minerals. Light on the tummy yet packed with nutrition,today's post-like my other combo meal Palak Paneer Paratha - packs in Spinach and Moong for a super healthy combo meal. Read on for the recipe. Firstly, thanks to all my blogger friends for their wonderful wishes on my 200th post and giveaway ! Another 15 days to go for the giveaway to end..
the 9th edition of Blog hop Wednesdays is here. I am paired with Rudra, who blogs @ Mom's Corner. I especially enjoyed browsing through the Recipe index, and finally zeroed down to her version of Vazhaipoo Paruppu usuli. 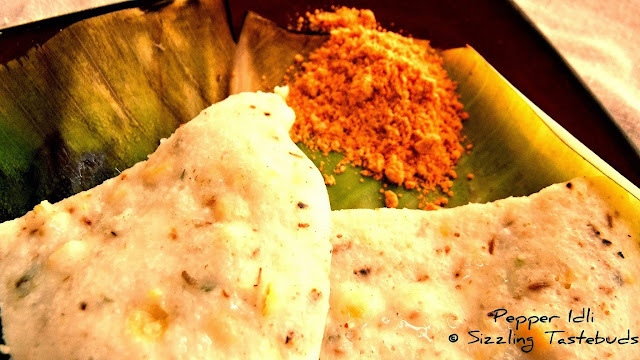 This is a classic Tamilnadu treat, and Rudra has also explained quite well on how to clean and obtain cookworthy banana blossoms in her post itself. But the twist to this I have given is to use moong dal instead of Toor Dal / channa dal that is generally used and also the method I used to make this an almost zero oil dish, and this goes very well with Vathal Kuzhambu or even Onion Sambhar. I loved this with Poricha Rasam (another of my comfort foods), and it was a very comforting lunch we had for Sunday. 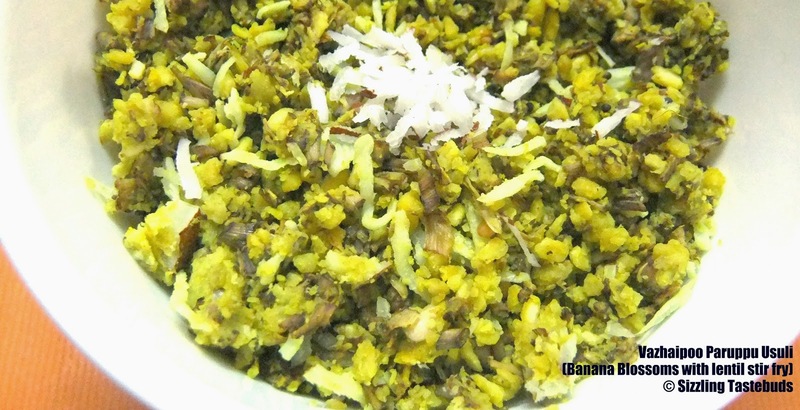 I hope you would also enjoy this version of Vazhaipoo Paruppu Usuli (loosely transalated as Banana Blossom stir fry with lentils). 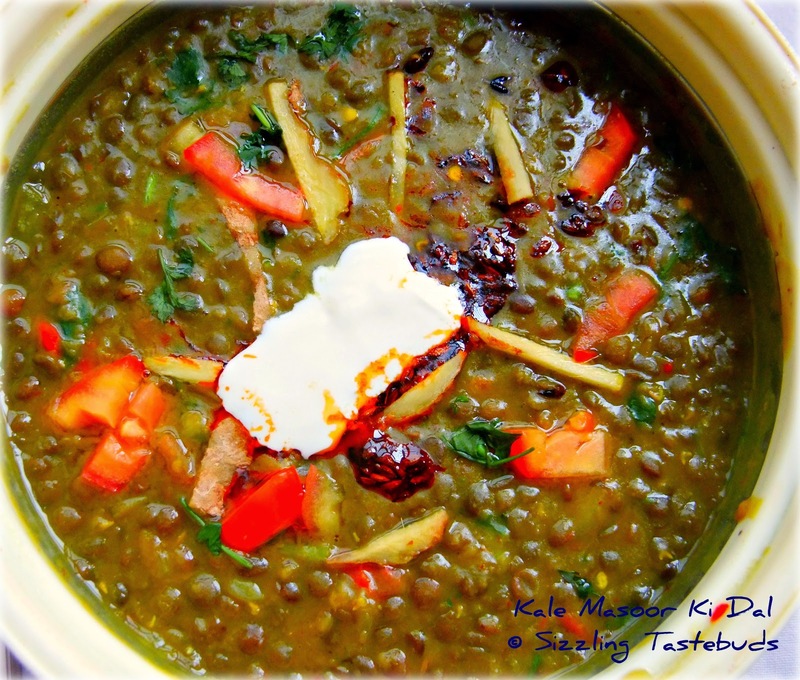 Check out other moong dal recipes here and dry curries / stir fry here. Let's now get to the recipe..
A very vivid childhood memory is of the butter man (vennaikaaran) pushing his loaded TVS 50 with bags of what was then pure coimbatore butter. Paati (my maternal grandmom) had made it a practice to use home made ghee made from butter - its grainy texture, the aroma when melted and poured on to hot pappu saadam (dal rice) is a memory that I cherish every single day. So, we didnt quite use store-bought ghee anytime at all, and the same was with hubby too. Soon after I married and moved cities, one of the first things on my agenda was to source readymade butter. Once, when I, in my gullible state asked for butter the storekeeper pushed me a packet of amul table butter. I asked him if he had anything else. He thought I was looking for low fat(?) butter and showed me Nutralite. I told him this wasnt the one I was looking for, but white butter. Exasperated that he was, he showed me margarine or dalda : which I promptly said I didnt need. Check notes for more tips on this dish. 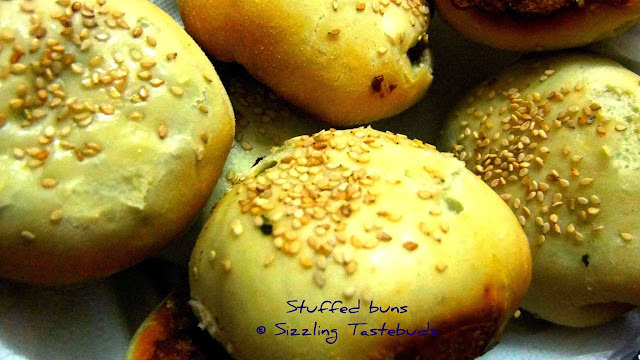 Sending this to Radhika's Winter Mela, PJ's Back to Basics - breads, event by Jaya. Now off to the recipe.. They say a picture is worth a thousand words, but in the case of a blogger friend whose blog goes by the name of Prema’s Thaligai, it speaks a million words.. I am floored by the sheer length and breadth of Prema's blog - a very popular one indeed, and her dishes and pictures just speak to you- be it the icing that she uses for her cakes or the traditional recipes that she dishes out with amazing regularity, I am sure you will agree as I do, that its indeed a feast to the eyes. 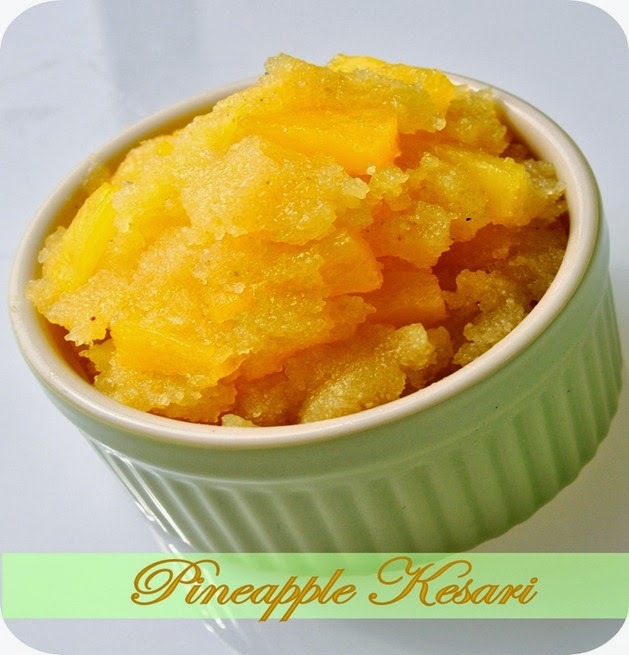 Happy to present Prema as our guest blogger on this monthly featured guest blogger series, and I am sure that her recipe for me - Microwave Pineapple Kesari - will sweep you off your feet with its visual and aesthetic delight. 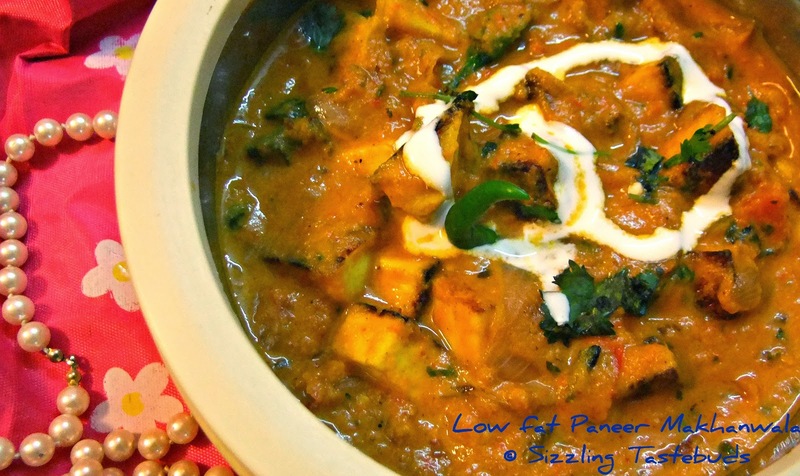 Thank you Prema, for taking off time and presenting this lovely recipe !
" Hi everyone. My name is Premalatha Aravindhan from Prema's Thaligai and I’m the baker, recipe developer and photographer for my blog - a little bit of everything. My home town is Thanjavur,tamilnadu, India.Currently living in Singapore.I have done Master in Computer Applications. At present, I'm a home maker and a proud mom On my blog I mostly share Indian traditional recipes n baked goods.I love baking and try to surprise my family with different treats. When my blogger friend Kalyani asked me to be her guest I agreed instantly. 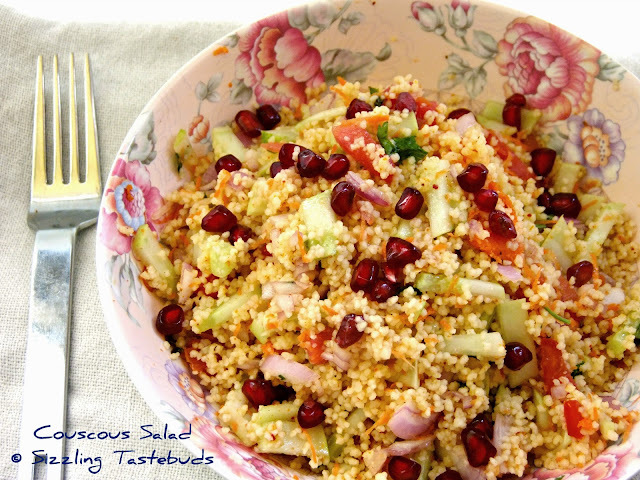 I love her blog, her easy and yummy recipes." Anyways, the verdict : Would I make it again? yes, definitely. And while most people prefer it bland, I would definitely spice it up a bit more with chopped sweet peppers, steamed veggies and may be even a spoon of mashed up lentil for a complete meal. 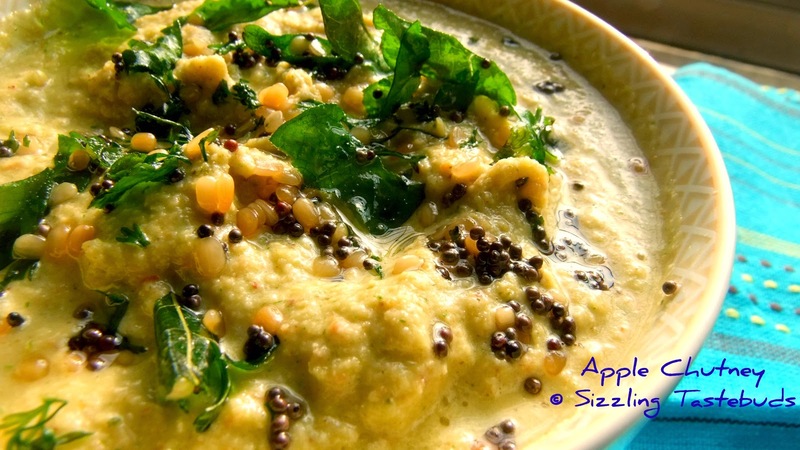 The warm olive oil combined with the cold and crunchy veggies and fruits is sure to warm you up during the winters. 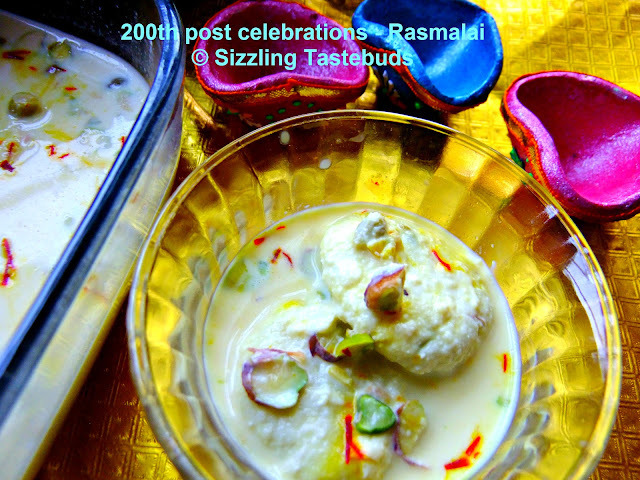 My 200th post- Rasmalai : a sweet tribute, and a giveaway ! Let me be honest - I had almost lost track of the number of the blog posts till a casual conversation over dinner - with a good friend of mine & S -@ Delhi last fortnight asked me how my blog was going - and I said it was good , and that I might have crossed about 150 posts..he gently corrected me and said as he keenly followed my blog, I was on my 181st post--wow ! that was some news, I thought, and then got to work on celebrating what is my blog's 200th post - a milestone that I had dreamt of, when I started this blog about 11 months ago ! Like Anna Pavlova said "To follow, without halt, one aim: There's the secret of success." 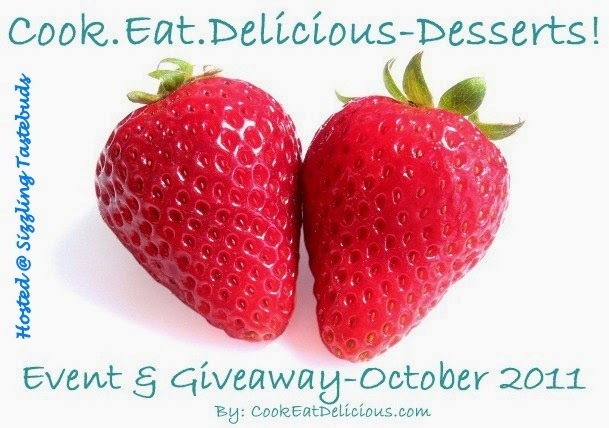 Happy to announce the roundup and winner of the CEDD - Strawberry Desserts event that I hosted this October. Thanks to Raven for this opportunity. Although I personally love strawberries, it was completely out of season to make any dishes out of the fresh fruit. I loathe the synthetic store bought crushes. I was very tempted to make ice cream out of strawberry essence, Diwali and other personal agendas took centre stage the entire last month. However, I have 14 yummy recipes sent across my dearest friends that I present to you on the roundup ... Thank you so much and appreciate the effort. Most people from the South of the Vindhyas (india) use coconut in their everyday cooking. Contrary to what was hyped a decade ago, coconut and its food products greatly help in reducing the cholestrol by boosting metabolism. For every believer in coconut, there would be two to scoff at the 'bad' fat from coconut. It does take a conscious effort to cut down 'unreasonable' quantity of coconut in everyday food, like vegetable peels have replaced most of the chutneys in my family's dinner today. But in totality, coconut should be had in moderation. For that matter, anything taken in excess is harmful. May be this link would throw some light on the benefits of coconut.. Now, why am I going on and on about coconut?? 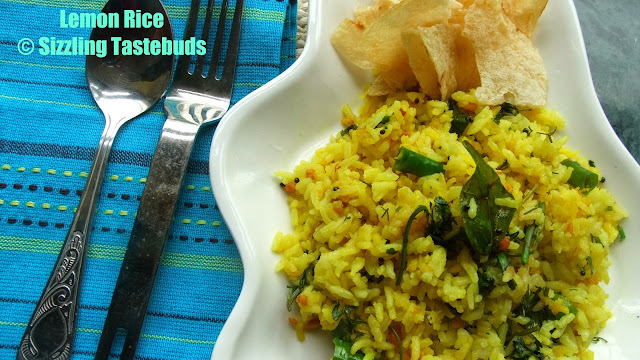 Coz, today's post is a yummy Coconut Pulav that makes use of freshly ground coconut, and is a quick dish to put together for a potluck or lunchboxes. 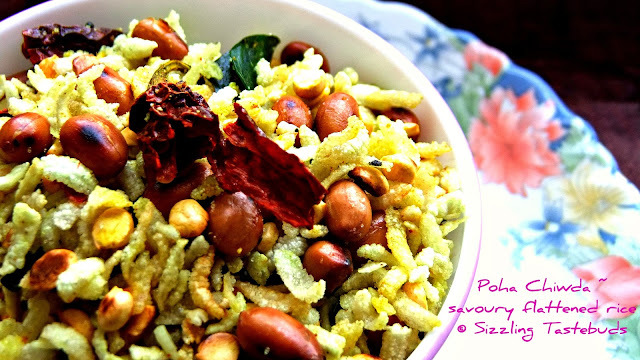 After upma, Pulav is probably something that I learnt cooking way back in high school - may be the humble one pot meals were my pathway to learn more cooking with Paneer-n-raisin Pulav, Soya chunks Pulav & baby Corn pulav added newly to the menu card. Today's dish goes well with any raita and roasted papad. One of the finest cookbooks I have acquired in the recent past (esp after I started blogging) is Vidhu Mittal's "Pure and Simple". Although I must confess here that I am not a cookbook person at all, but I love collecting them - it gives me various ideas which I tweak to suit my family's palate. There are many reasons I love this book by Vidhu Mittal - the simplicity of ingredients, clear write up, and not to forget stunning photographs. But more than anything, love it most 'coz its all about Pure Vegetarian cooking - something that I rustle up in my small kitchen everyday. So, its quite handy for me to refer this. Today's dish - Kale Masoor Ki Dal - is an exception for I have reproduced the recipe to the T, and boy was I impressed :-) We had this for Sunday brunch along with Soya Chunks Pulav, and the combo was amazing !